Basin Harbor Club isn’t a hotel — it’s a vacation destination. 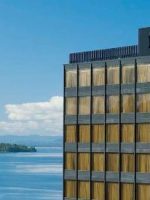 Located on Lake Champlain in Vermont, the hotel affords beautiful vistas of the Adirondack Mountains in New York. In fact, they’re so close that guided hikes from the resort are offered! Other ways to enjoy the lake and natural surroundings include lakeside dinners al fresco, lake swimming (complete with a water trampoline! ), a beach, water sports rentals, and paved pathways throughout the resort. The fun continues with a kids’ camp, teen program, and a weekly schedule of events packed with even more fun, from move nights to fairs with carnival food and rides. Convenient for families, meal plans are also offered, allowing guests to package accommodations with meals for a nearly all-inclusive experience. 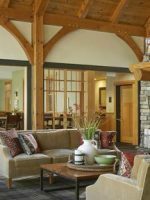 Of course, you may want to explore other areas of Lake Champlain and the Lake Champlain Byway while you’re here, but you don’t have to — you can easily enjoy a vacation without leaving this special, family-owned and operated property in Vermont. 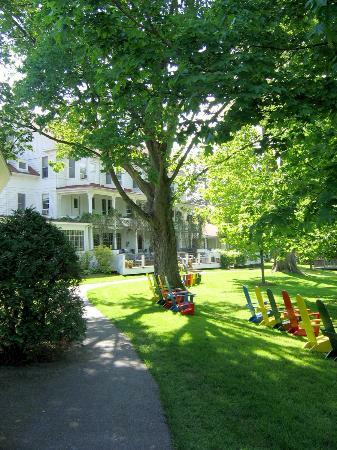 Basin Harbor Club offers a total of 45 guestrooms, spread across four buildings on the property. Mini-fridges are included in all guestrooms, as are flat-screen TVs. 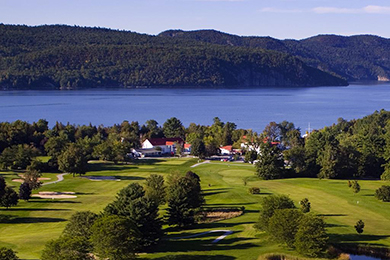 Perhaps the best feature at Basin Harbor Club is its cottages, many of them situated right on Lake Champlain. And while there are 74 of them, no two of them are alike, offering a truly unique stay. All cottages sleep up to eight guests -- perfect for families -- with kitchenettes that include mini-fridges, and coffeemakers. Some cottages don't have TVs, allowing families to disconnect. A celebration of an important birthday took place at BH in early October. Family involvement made this weekend very special!! BH is very special and has been for years. Our daughter was married there many years back. Aside from special birthday celebrations, BH does a remarkable job with weddings of any size. While there over a three day weekend, BH serviced three weddings! all the amenities including a fantastic golf course are second to none. Can’t wait till Spring....I have no choice ! Very picturesque spot, nice food and very friendly staff. Food was tasty and a nice range was offere at most meals. This being a budget meeting, we did not get much free time for any leisure activities and it was pretty cold outside. But the scenery is great and the staff are excellent. The highlight of a visit to Basin Harbor Club is the beach and lake swimming -- there's even a diving board on the lake and a water trampoline! In the summer, a lifeguard mans the waters. The resort has a giant pool, located next to the Ranger Room. Pool games are often hosted in the summer months. Offered in the summer months, Kid's Camp is divided into three age groups: 3 to 5 (Champs Camp), 6 to 8 (Harbormates) and 9 to 12 (Explorers). While the morning sessions are most popular, afternoon and evening activities are also offered and include everything from scavenger hunts to guided hikes. 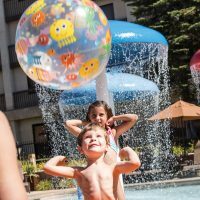 Access to Kid's Camp, which includes a designated clubhouse and playground, is included in rates. 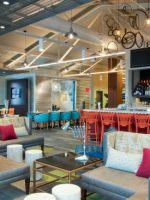 It's fun to be a teen at Basin Harbor Club, which offers Teen Escape, a program that includes organized games, lake cruises, dance parties, mocktail hours and even offsite excursions! The resort has a few tennis courts, with both adult and kids' clinics offered throughout the week. Tennis equipment can also be rented at the resort. 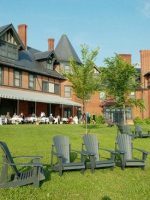 In the summer, the resort offers a full weekly schedule of events that include guided hikes (across the lake in the Adirondack Mountains), parties on the beach, movie nights, bingo, garden tours, kitchen tours, and cruises on the lake. On Tuesdays evenings, the resort also hosts Harbor Fair, with rides and carnival food. Meal plans are available for families who would like to package their rates and create an all-inclusive-like experience. Breakfast is served in the Main Dining Room, which features lovely views of Lake Champlain and the Adirondack Mountains. In the summer, guests head to the dining room for formal dinners and themed events that are ideal for both family and date nights. 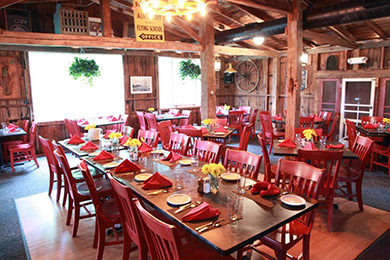 The Red Mill Restaurant serves hearty pub fare and libations in a cozy setting. Bonus: There's a playground behind the restaurant where kids can blow off some steam while you wait for your food! For more information, click here. The Ranger Room is where you'll find lunch (an extensive buffet complete with a sundae bar) in the summer months. Overlooking the pool, it's a nice place to grab a bite to eat while the kids swim or before everyone heads to the pool together. Make a reservation for dinner by the lake! Basin Harbor Club serves delicious dinners al fresco in the summertime, with classic barbecue favorites and fish on the menu. Kids' options are available, as well. The resort provides complimentary Wi-Fi, but service may be spotty in some of the cabins. It works well in most common areas, including the restaurants. Open 24 hours, the resort's fitness room is more like a mini-gym, with cardio machines, plenty of free weights and most major strength training equipment. Pets are welcome to stay in select accommodations for $15 per pet, per night. Located by the fitness room, a coin-operated laundry facility is available to guests. Basin Harbor Club is a seasonal resort, open mid-May through mid-October. It is, of course, busiest when school is out of session. Basin Harbor Club is seemingly off the grid in Vergennes, Vermont, with Burlington (about an hour away) the closest "city." 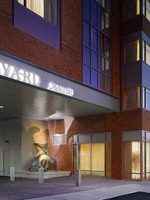 And while Burlington has a small, regional airport, you'll find more flight options through Montreal-Pierre Elliott International Airport in Canada (about two hours away in Quebec) or Albany International Airport in New York. The resort, while large, seems much bigger than it actually is. You can easily walk everywhere, with paved trails throughout the property. Staff with golf carts can also assist guests in getting around during their stay and at check-in and check-out. The resort's weekly schedule of events includes activities that are perfect for couples, including cocktail cruises and paint-and-sip parties. Send the kids to Kid's Camp for a few hours and enjoy some alone time! It's also nice to simply settle into some Adirondack chairs and enjoy a bottle of wine at sunset.